Freehouse. Popular multi roomed pub named after the ship from which the beams were used to build the pub in 1840 - the details of every landlord since then are displayed in the foyer. Some tasty beers on offer - and all very well kept. Pool table. Food served. Car park. 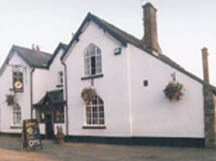 The pub is situated on the B4386 in the Clun Valley. Pub website. The annual Kangaroo Real Ale Festival every August is well worth a visit. Tel - 01588 660263. Visited Oct 2008. Readers comments - The SS Kangaroo couldn't have been used to build the Kangaroo Inn in 1840 because the ship wasn't built until 1853. In 1888 she was renamed 'Selamet' and was scrapped about 1901 although 1910 is also mentioned. So possibly the timber became available for building use in the early part of the 20th century.